Over the past few months, I’ve noticed that people now consider a fifth wall – their ceiling – when painting their rooms. Chalk this up on the list of ‘things I never thought about before.’ Back when I was a kid, you’d do one of two things when decorating ceilings: either you’d go nuts with those glow-in-the-dark stars (or bleach, if you had a black light and very permissive parents), or you’d try (and fail) to paint a beautiful sky – which, more often than not, turned out less like Michaelangelo and more like the Simpsons. 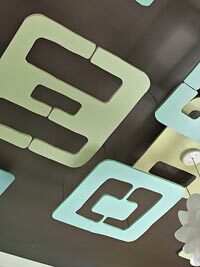 Last night, I was reminded, and heartened, by the new approach being taken with regards to nursery ceilings. It makes sense – given that young ones do spend much of their time staring upwards – although a simple mobile often suffices. Despite the early demise of Domino magazine, the corresponding book is still a strong guide and look book for interior spaces. Here’s where I found the above picture. Knowing that the black wall at right is actually chalkboard paint makes the room feel more whimsical. The striped ceiling is a curious, but interesting, way to add visual interest. And, wow. I’m not sure if I like this, but it’s certainly worth mentioning. To me, it’s a bit theme-y, having carried the bee motif to the nth degree, but a sign of incredible hard work and dedication on the part of these parents-to-be. 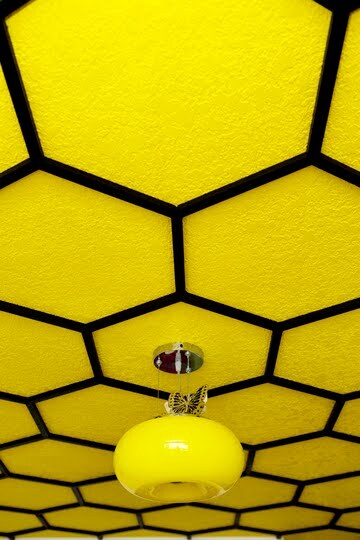 Apparently, they spent 40 hours creating and attaching the black honeycomb shapes out of wood molding. For a modern alternative to the aformentioned mobiles, I like this suggestion from Better Homes & Gardens magazine. I don’t know how anyone could replicate it without a personal jig saw, but it’s a clever suggestion – all you need to do is drill holes, then mount these plywood shapes with thin chains or cords. 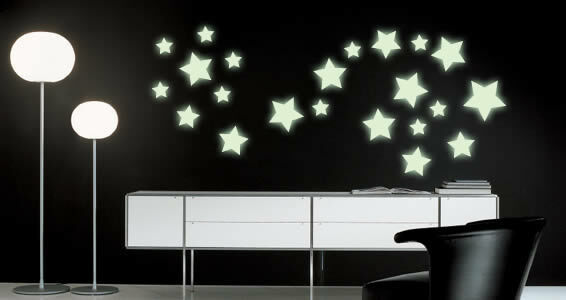 This could work in a rental apartment if you don’t want to actually paint the ceiling itself. But this, by far, takes the cake. I can’t remember where I found the image, but will continue to search for the source. My first instinct is – HOW COOL IS THAT!!! – despite my aversion to rooms that feel like theme park rides. 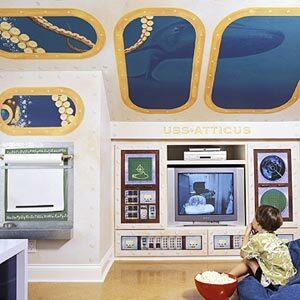 I just fear the day when that little boy grows up and asks his mom for his room to be plain and simple again. It would break my heart to paint over such a valiant effort, which looks like it took hours and hours to create. If it were a decal, however, I wouldn’t feel so bad.